The latest in Tailgate Grills is Coleman's RoadTrip® LXX propane grill. 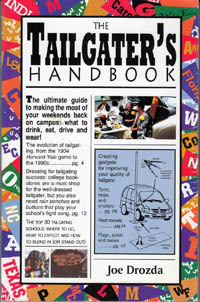 Just like past RoadTrips it rolls, and it folds down to be easy to put in your vehicle for game day cooking. It’s easy to tote around and set-up in the tailgate lot too. 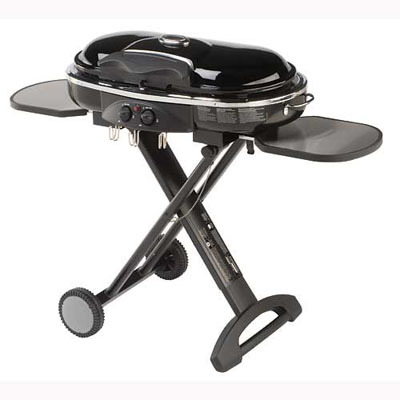 Just roll it with one hand to your favorite cooking spot and set it up in a matter of seconds with the lift and lock system. It lights with a push a button matchless lighting system and operates on those small inexpensive propane cylendars. This grill has increased its heating and now produces 22,000 BTUs. That makes it as powerful as those large gas grills found on patios. Finally somebody has made a portable drip coffee maker that works. 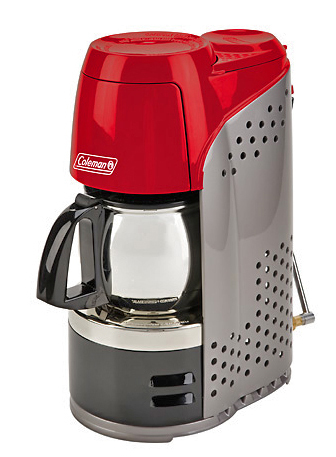 Coleman's propane powered coffeemaker has no cords, stove, or percolator required. It operates on a single standard 16.4 oz propane cylendar. It's easy to start- simply push the InstaStart™ auto ignition button to get the coffee brewing. Ours ran more than four hours on one cylendar. Now we can have hot coffee at those breakfast tailgates for games that start at noon! Click here to send us a picture/idea.